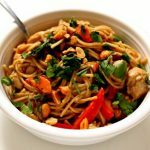 Instant Pot Thai Chicken Noodles–a true one pot meal! The chicken, sauce and noodles are all cooked at the same time in minutes in your electric pressure cooker. 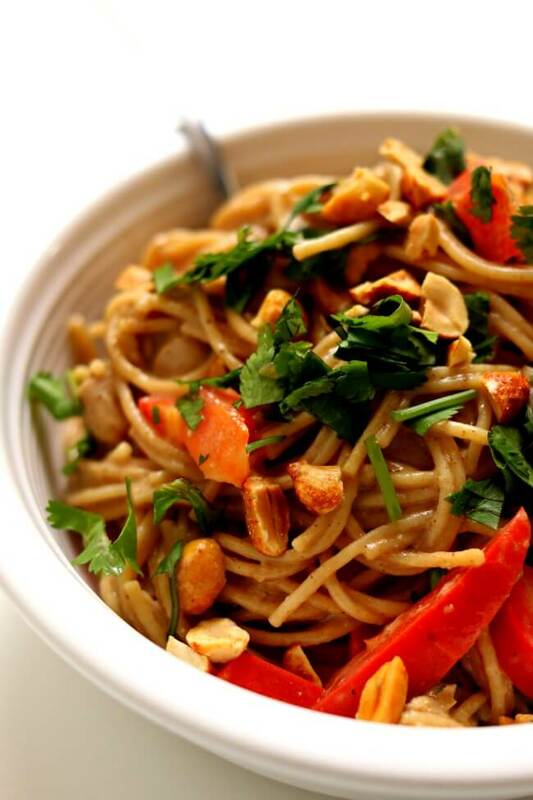 The noodles are enveloped in a mild creamy peanut and lime sauce and the peanuts, cilantro and red bell pepper give texture and color. A delicious and easy recipe to make any night of the week. I’ve been making this recipe in the slow cooker for years. I decided to give it a try in my trusty Instant Pot. I realized that it would be possible to make it a true one pot meal by cooking the chicken and noodles at the same time. I danced around the kitchen when I opened the pot, stirred and tried the noodles. They tasted sooooo good and it was such an easy recipe to make. I love the pop of lime and the crunch from the red bell peppers and peanuts. The peanut sauce is not overwhelming and the cilantro brings everything together. At my house we all loved these noodles! Chicken: I used boneless, skinless chicken thighs that I cut into bite-size pieces (that way they cook at the same rate as the noodles). I buy my chicken thighs in a bag at Costco in the freezer section for about $2.00 per pound. You can also use chicken breasts for this recipe. Better than Bouillon Chicken Base: I love this stuff! I use it in any recipe that calls for chicken broth. I combine 1 cup of water with 1 tsp of the chicken base. It works well because it comes in a small jar that you can keep if your fridge for months. Soy sauce: You’ll definitely want to use a low sodium soy sauce or a tamari sauce for this recipe. Regular soy sauce will make the noodles too salty. 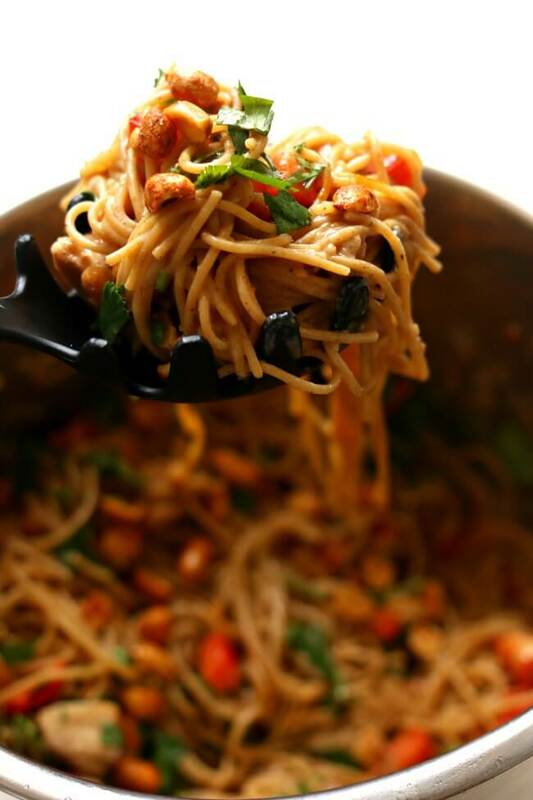 Pasta: I used whole wheat thin spaghetti noodles. You can use regular white spaghetti noodles if you’d like. I just prefer using whole wheat pasta when I can. Lime juice: I used a quarter cup of fresh lime juice. This definitely gave the noodles a lime-y flavor…which I love. If you are unsure if you want that much lime flavor start with 2 Tbsp of lime juice and go from there. To make Instant Pot Thai Chicken Noodles I used my 6 quart Instant Pot Duo 60 7 in 1*. I love this Instant Pot because it has the yogurt making function which I use almost weekly. It has two pressure settings (high and low), and there are also little slots in the handles so that you can rest the lid there instead of putting it down on your counter-top. A true one pot meal! The chicken, sauce and noodles are all cooked at the same time in minutes in your electric pressure cooker. 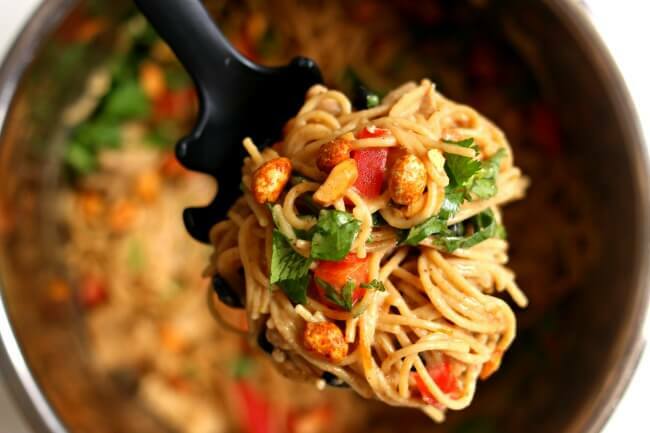 The noodles are enveloped in a mild creamy peanut and lime sauce and the peanuts, cilantro and red bell peppers give texture and color. A delicious and easy recipe to make any night of the week. Turn your Instant Pot to the saute function. When the display says HOT add in the oil. Add in the chicken and saute for about 3 minutes. Add in garlic and saute for 30 seconds. Add in the chicken broth and deglaze the pot. Add in the soy sauce and red pepper. Break the noodles in half and add them to the pot. The liquid should cover the noodles almost completely. Cover the pot and secure the lid. Make sure valve is set to sealing. Set the manual/pressure cook button to 3 minutes on high pressure. When the time is up move the valve to venting. Open the pot and stir in the lime juice and peanut butter. There will be a bit of liquid in the pot but it will get absorbed fairly quickly. Stir in the bell pepper and cilantro. 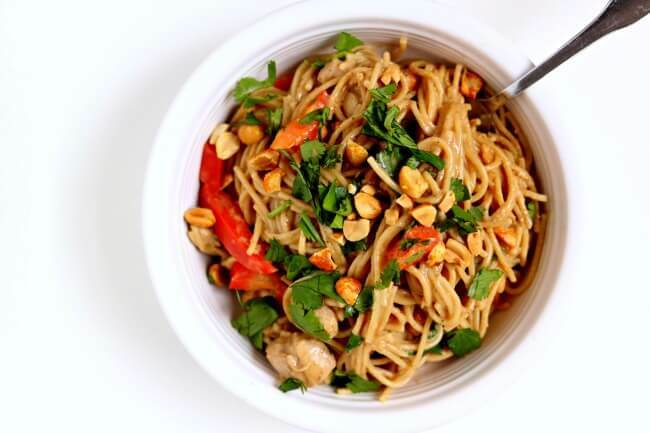 Scoop noodles into bowls and top each one with 2 Tbsp of peanuts and additional cilantro, if desired. Chicken: I used boneless, skinless chicken thighs that I cut into bite-size pieces (that way they cook at the same rate as the noodles). I buy my chicken thighs in a bag at Costco in the freezer section for about $2.00 per pound. You can also use chicken breast for this recipe. 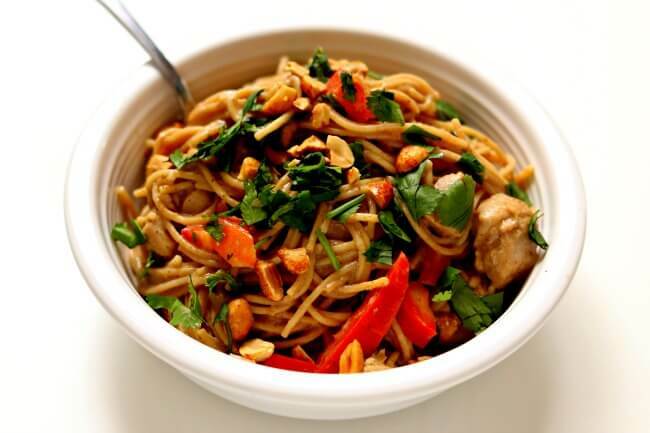 Like this recipe for Instant Pot Thai Chicken Noodles? Get all my new recipes delivered to your email inbox by signing up below. Hi Karen, I’d like to add this to our meal plan for next week, but was thinking about adding more veggies so I don’t have to make a side. What would you recommend? Can I just add some thinly sliced carrots, celery or other crisp veggies and if I did would I need to change the ratios at all? Thanks! Yes I bet that would work nicely. No need to change the other parts of the recipe. Hi. Looks yummy! We have an 8qt UP. Would this work as is or should we amend it? Hi Mary, you can make it as is. This looks delicious! Can’t wait to try it. Would this full recipe be possible to do in a 3 quart instant pot? I have made recipes in my 3 quart pot instead, where the poster used a 6 quart instant pot, without any issues. Could we do the same for your recipe here or would you recommend cutting it, cooking the noodles separately, etc. instead to account for capacity constraints? with only 8 ounces of noodles I think it will fit just fine in the 3 quart. let me know! I love this easy, tasty meal. It also cooks pretty quickly so if you Do some prep the night before or before work, I can be ready really quickly after work. It’s a regular in our family rotation for the last several months. Can I use Thai rice noodles? I am not familiar with the thai rice noodles. They may cook too quickly for a pressure cooker. How long do they take on the stove to cook? Definitely not … Rice noodle cook by pouring boiling water over them and covering. The IP would destroy them. This was so good that my picky eaters had seconds and thirds. Hubby requested it again today, though we just had it less than 2 weeks ago. I doubled it because I think the leftovers will heat up well, added the bell peppers in with the stuff at the beginning, and left the crushed red pepper for everyone to add to their liking. Very easy and yummy. Only takes about 30 mins to make including cooking. Will def make again! Thanks! I made this for my boyfriend one night, and he’s asked for it again multiple times since. So tasty! My favourite instant pot recipe to make. Can I use ramen noodles instead of spaghetti? I’d be nervous they would cook too quickly and get super mushy. Loved this recipe! The lime juice gives it a nice fresh taste. I added a little sriracha as my family likes a little bit of heat. Super fast, very little effort and delicious taste. Thanks for another winner Karen! Thank you; we both very much enjoyed this recipe! It is so much like chicken satay which we both love! Definitely make sure to use both low sodium soy sauce & low sodium broth. I did use the broth but did not have low sodium soy and it was a bit salty but still amazing! Rave reviews from my picky daughter! Couldn’t wait to go back for seconds. Thanks for the wonderful recipe. The fish tasted fresh and flavorful but my husband and I both thought there was way too much peanut butter for our taste. I think we could have used half the amount called for. But we are new to instant pot and are going to keep trying your recipes! Can sunbutter be used instead of peanut butter? We have an allergy in our home. I’m sure it could! I’m not familiar with the taste of that so I’m not sure how great it would taste. Can this be made as s gluten free recipe using Gluten free Soy and Gluten Free pasta? Hi Kat, I am sure that it could. I am not familiar with the gluten free pastas but if they cook similar to regular pasta (as far as time goes) then they should work. Let me know how it turns out. Okay this is good to know. Thank you.